Nimia Cabrera’s face lights up when she talks about her work. But she’s not just picturing the cozy turtleneck sweaters or embroidered dresses she sells through her online boutique, Elohim + Nim. She’s picturing the faces of those whose lives she hopes to change. In the nearly two years since she launched Elohim + Nim, the 25-year-old has traveled to 10 to 12 markets, built up her store’s inventory and opened the business’ first showroom in Baton Rouge. Cabrera’s online shop offers clothing, jewelry, beauty products and gifts. But for her, the shop is about more than clothes. She donates 10% of revenue to a different nonprofit each month, such as the American Red Cross, Susan G. Komen Foundation and Loveabull Rescue Society. Next year, she has bigger plans. Up until now, the LSU grad has outsourced Elohim + Nim’s stock of apparel and accessories. In 2018, she aims to employ three to four Honduran women to make original products for her brand. Cabrera plans to start small—she’s working to form a partnership with Greek sororities where her business would custom-make members’ outfits during fall recruitment. But eventually, she sees an opportunity to transition into having all of her shop’s stock made originally for her brand in the next three to four years. Honduras is close to Cabrera’s heart. She grew up there until moving to the United States at age 8. While visiting last summer, she saw firsthand the poverty and substandard living conditions, particularly orphaned children without access to basic hygiene. The experience was heartbreaking, but it struck a chord with her. “I saw the need for love in these kids, because they’re forgotten,” Cabrera says, tearing up as she talks about helping them. By empowering women to work, utilizing skills like sewing, they can in turn provide better lives for themselves and their children. Cabrera’s Christian faith is an underlying theme in everything she does, and it shows even in the name for her store. When she started her business in April 2016, she named it Elohim after the Hebrew word for God, and Nim for her childhood nickname. 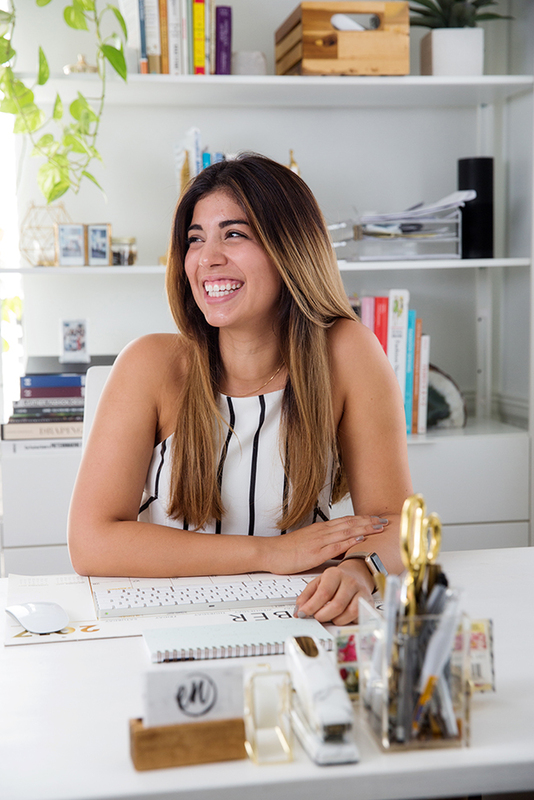 She built the business off principles she learned from majoring in textiles, apparel and merchandising as an LSU undergrad, and later taking online businesses classes from the Fashion Institute of Technology. Elements of Cabrera’s own style are evident in every facet of her store. The contemporary layout of her website shows her preference for simplicity. Her bright energy is infectious and is reflected in her intimate work space, too. Her Sherwood Forest office is organized, minimal and full of natural light and plants. The wide-legged white linen pants she wears today seem to match her furniture selections, all in neutral shades with clean lines. Cabrera seems to have it all together. But she concedes the road getting there wasn’t easy—and still isn’t. Thus far, Elohim + Nim has been a one-woman show. She runs the business from top to bottom, from mailing out orders, to posting on social media, to scouting and working pop-up events around Baton Rouge. When she’s not running her store, she splits her time between her second job and classes she’s taking as she works toward an associate’s degree in graphic design to sharpen her digital communication and marketing skills. Eventually, she hopes to open a storefront featuring her brand’s original designs, she says. This article was originally published in the December 2017 issue of 225 Magazine.